With DIALux you can prepare photo realistic visualizations of your light planning and send them to your customers via email, or upload them to a server. For a better realism, the program can use different textures and furniture, and it uses an integrated ray-tracing module. You can also save your results in a .PDF format file, or export to .DWG and .DXF files. 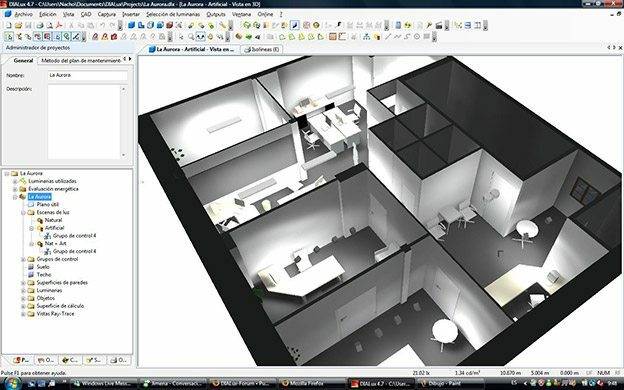 You can even import files in those formats to apply the lighting with DIALux. 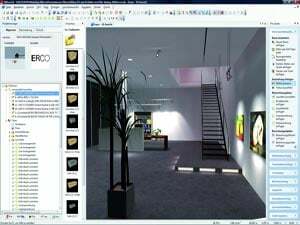 The free and complete software developed by us for professional light planning is open to luminaires of all manufacturers. A software by planners for planners. Used by many hundredthousands of light planners and designers worldwide. And their number is growing from day to day. Create your virtual worlds simply and intuitively with DIALux. Document your results in breath-taking, photorealistic visualizations. Delight your customers with daylight and artificial light scenarios through which they can glide with wild camera runs. Rely on the CAD data of other architecture programmes and re-export your files easily. Or use any 3D models from the Internet – it’s child’s play. DIALux is continuously being developed by a team of 20. You can plan in DIALux with the luminaires of the world’s leading manufacturers and therefore have the greatest possible freedom in the design process. And the the list of international partner companies is getting longer and longer. Awesome site and software details. Amazing site for electrical guys. You guys are the bomb. Thanks 4 all this helpful softwares/tool.